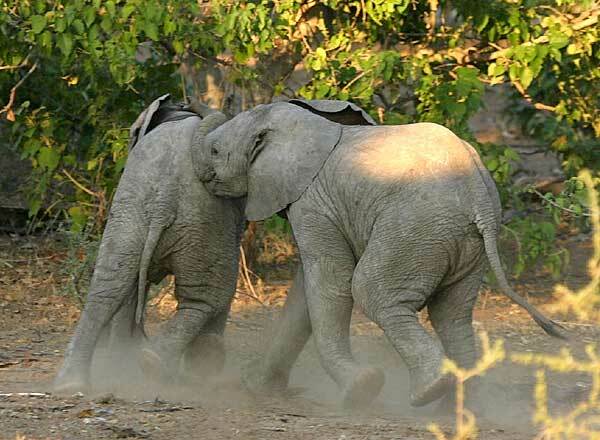 Caption: Baby elephants (Loxodonta Africana) stir up dust as they push and jostle each other, Mashatu Game Reserve, Botswana. Photo:© Scotch Macaskill. Location: Mashatu Game Reserve lies in the remote Tuli Block in the eastern corner of Botswana. Although not as popular as Botswana's Moremi Game Reserve and Chobe National Park, the area boasts a diverse wilderness of savannah, riverine forests, marshland, open plains and rocky outrops. There is abundant wildlife and the area is known for its large herds of elephtants. Predators such as lion, leopard, cheetah, and hyena are attracted by large numbers of migrating wildebeest, kudu, eland, and impala.